I first came to the laidback fishing town of Zihuatanejo (pronounced “zee-watt-an-a-hoe”) eight years ago, to visit an old friend. At the time, I didn’t even know its exact location, until I looked it up. I guess you may not know it either: it’s on Mexico’s Pacific Coast, about 150 miles northwest of Acapulco. I would never have believed then that, after spending more than 20 years in real estate in Southern California, I would eventually live in an area that was exactly what I wanted for my future retirement. My friend’s invitation to come down and catch a marlin certainly changed my whole life. Who knows…maybe learning about this magical place might change yours too. On my very first night in “Zihuat”—as we locals call it—we went into El Centro (city center), and visited the fresh fish market. Just $14 paid for a barbecue on the beach for six people. There are also dozens of other eateries in town to choose from that range from $5 to $10 for a meal and drinks for two people. The taco carts are even cheaper, with choices including fish, chicken, and carne asada (marinated steak). For a real authentic flavor, there’s also the local favorite of chapulines (fried grasshoppers—you’ve just got to try them!). I was also amazed at the dozens of fresh meats, fish, and produce stores that cost pennies on the dollar. Trendy restaurants, galleries, and the seemingly endless window shopping make this an easy choice when considering an alternative lifestyle. If you want a little fancier dining experience, I recommend Ristorante il Mare restaurant. Perched high above the bay, the views are amazing, and the service is great. Try the shrimp seafood platter, served in a hollowed-out pineapple. Dinners are modestly priced at around $10 to $15 per person. If visiting with other expats is your thing, then Bandidos is the spot. This eatery by the marina is popular with locals too. It has great food, and a complimentary shot of tequila is a normal welcome gesture by the management. A typical day for me is to go down to the local fruit and vegetable stand to get a fresh juice drink of my choice (I like carrot, celery, and apple). This sets me back about $1.50. I can have a nice breakfast for $3, or sometimes I skip it and wait until lunch for my favorite choice of fish tacos with all the trimmings for about $5. A couple can really live a wonderful life here for around $1,000 a month. Regarding real estate, rentals for a fully furnished two-bedroom condo can start for as little as $350 a month. As you go up the hillsides overlooking the bay, you can find a great place with a spectacular view of the bay ranging from $600 to $1,000 a month, depending on the size and amenities. Buying a place is a real bargain if you want to make something more permanent. Typical prices are $75,000 for a condo, all the way up to $250,000 for a four-bedroom casa. 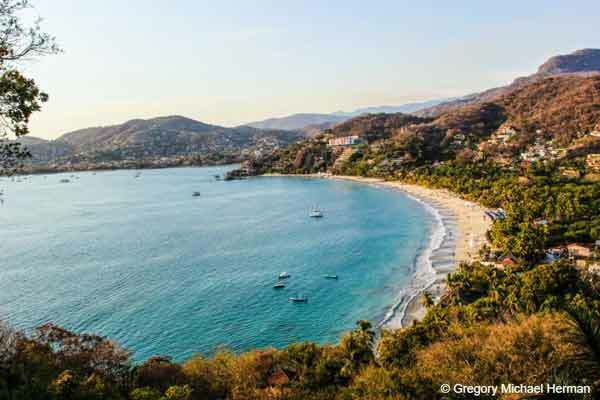 For all you sun worshipers, the beaches that surround Zihuatanejo are to die for. You can go down to Playa Ropa and rent a jet-ski for an hour for $40, or take out a Hobie catamaran. 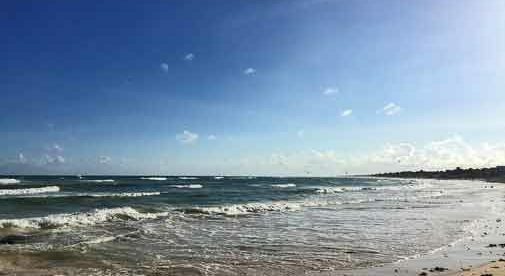 The beach is lined with palm trees, while the sandy bottom and gentle wave action of the water is ideal for the casual swimmer to enjoy the sights of the beautiful homes and boutique hotels that cover the lush, green hillside. With Mexico City just 45 minutes away by jet, or Acapulco three hours by car, Zihuatanejo has something for everyone. Come visit the smiling faces and see for yourself.